﻿ If there’s one thing that Death Valley Knights can be commended for, it’s their outstanding level of brand synergy, at least outside of the music. With a name that inspires that outlaw vision and artwork that brings up that exact iconography to justify it, there’s an aesthetic direction that this band are taking that’s impressively fully-formed. Perhaps more so than the music even, as getting into the meat of Valhalla Vintage reveals a listen that’s fraught with inconsistencies that can’t be overlooked. It’s not all bad though, and on the basis of part-trad-metal enthusiasts, part badass biker crew that the band are trying to be, the title track and Be The Grizzly definitely suffice. At the minute, both feel like approximations of a baby Hellyeah, particularly the former with its barnstorming chorus, but there’s a sleazy metal crunch that works in the right circumstances. If anything, Death Valley Knights are at their most deft in the instrumentation, especially on Taste Of The Kill which sees the band indulging in their love of classic metal with spiraling fretboard dashes going off in every direction. The problem is, in the tracks where that clearly-defined expertise is honed in on and everything else is pushed to the side, it can all feel a little by-the-numbers. It’s definitely not bad – Death Valley Knights’ instrumental chops are enough to just about save them from that – but compared to the burly, whiskey-chugging swagger of the opening tracks that’s also clearly-defined but has more of an edge, and Valhalla Vintage can start running together in terms of what actually benefits the band. Again, on a track like Taste Of The Kill with its hefty chug and standout guitar work, there’s a tangible quality to latch onto, more than the played-out debauchery of Shut Up And Drink or the unmemorable Legacy (complete with some truly dire vocal production) have to offer. At the end of the day, while Valhalla Vintage is plagued with issues that need rectifying, there’s enough here to see why it would appeal to classic metal fans the most. It’s got clear drive and pace that the band can pull off well, and even if there’s nothing particularly new or earth-shattering here, Death Valley Knights are able work with what they’ve got. That said, that’s something that needs to be taken into account in future; there are plenty of bands like this that get nowhere, and Death Valley Knights need to find an identifiable voice to ensure they’re not one of them. 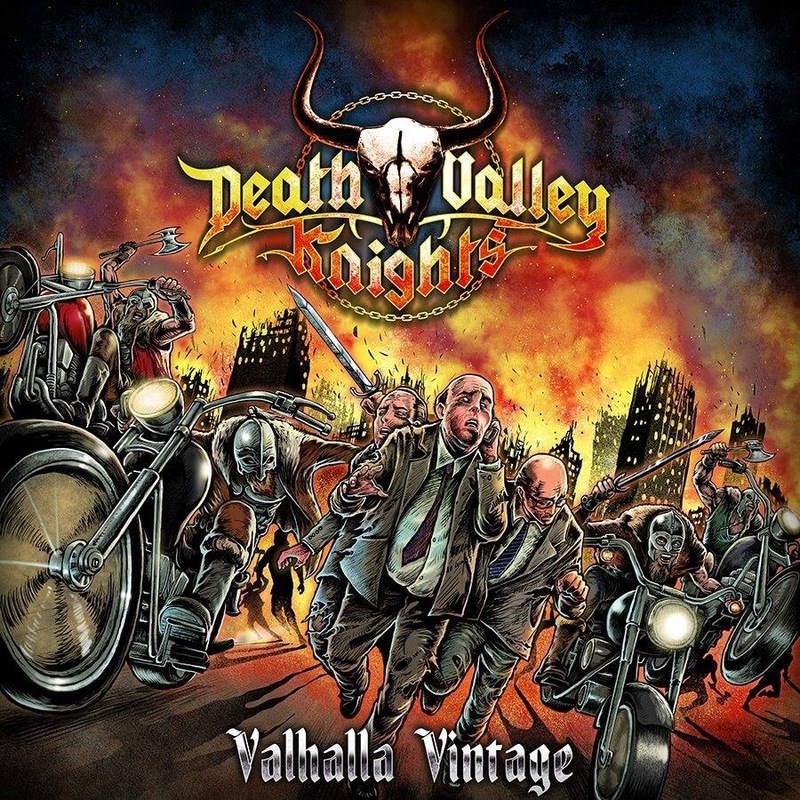 ‘Valhalla Vintage’ by Death Valley Knights is released on 28th July.